Work on the fifth collaboration between John Foxx and Louis Gordon, began in early 2006 under the working title of Impossible. Recording progressed, and over the Summer, the duo played some of the new songs live on tour, prior to the album’s eventual release in November. sci-fi movies and comic books as "trash", and his dreams called ‘impossible’ – a subject which manifests itself in “Impossible”, the song which would have been the title track, had the album kept it’s working name. 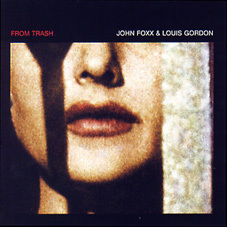 From Trash is perhaps more appropriate as a title though, with Foxx and Gordon’s inspirations having grown out of all this so-called “trash”. Musically and lyrically it is typically Foxx, with the recurring themes of cities and that of adopting other personas – evident on “Another You” and “The One Who Walks Through You”. An album of electronic film noir, From Trash has a a very cinematic atmosphere, and is littered with familiar lyrical utopia that graces all of John’s finest works, placing the listener is a vast, ever-changing cityscape. Backed with synths slightly reminiscent of early Human League, a cool, crooning vocal from Foxx flows through the album, with occasional bursts of backing vocals from Louis Gordon. Some of the music connects to previous albums such as The Pleasures of Electricity and Crash and Burn, with “A Million Cars” standing out as one of the album’s most addictive tracks, along with the stomping synth-glam of “Friendly Fire” and the intensity of “Impossible”. Foxx’s admiration for Kraftwerk and The Beatles comes together in “A Room As Big As A City”, and one particular hidden gem on this album, “Never Let Me Go” was salvaged by Louis Gordon at the last minute and thrown back into the mix, having been recorded quickly and previously abandoned. The thumping title track and an extended version of “Freeze Frame”, had previously appeared on the exclusive 2006 tour CD, The Hidden Man, and another vaguely familiar track is a revamped, slower and darker version of the Nation12 track “Your Kisses Burn”. Written and recorded in just a few weeks, the From Trash sessions proved highly creative, producing a wealth of musical ideas and adventurous starting points. The completed tracks that didn’t make it on to the final cut of the album, would see release just weeks after From Trash hit the shops, in the form of Sideways. The overall sound of the album is much tighter and consistent that some of its predecessors, and at just over 45 minutes, it’s the perfect length. With this in mind, From Trash feels like the culmination of the duo’s work since their first collaboration, Shifting City, offering a solid set of contemporary electronica in true Foxx fashion.